Попробуй на чистом field настроить сначала уже отображение, а уже затем делать "add condition" для подключения зарядки и всего такого. отпиши потом получилось или нет, мне просто лень щас свой мод гонять, если не получится, то это может быть баг самой прошивки, там еще не все моменты исправно работают. New Paranormal 250C - What do I need to do? I do not recommend using other people's profiles. You need to test your batteries for more accurate display of charge level. According to my observations, the tests only affect the display of the charge level, this does not affect the work, you can leave the default settings, or adjust the schedule itself, in manual mode. Hey. 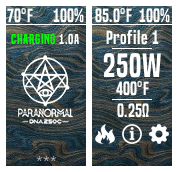 Paranormal DNA250c very accurately determines the battery charge. I can assume that your batteries have been used for a long time and have lost their initial capacity and the device has identified and shown it to you. I advise you to replace the batteries with new ones and use an external charger.